JAXA | Watari Shinichi "Improving Our Understanding of Space Weather"
TOP > Special > Watari Shinichi "Improving Our Understanding of Space Weather"
Dr. Watari joined the Radio Research Laboratory (now NICT) in 1984. From 1994 to 1995, he served as a visiting fellow at the Space Environment Center (now the Space Weather Prediction Center) of the National Oceanic and Atmospheric Administration (NOAA) in the United States. He has been in his current position since April 2011. His research specialty is space weather forecasting, such as solar wind disturbances and geomagnetically induced currents associated with solar activity. Q. What is space weather forecast? People tend to think that outer space is empty, but in fact it is full of particles with electric charges. Change in the space environment caused by these particles is called space weather, and so, like with weather here on the Earth, we have space weather forecast. We forecast space weather by studying the Sun and solar wind. I’ll give you an example of space weather. A solar flare, which is an explosion on the solar surface causes strong X-ray radiation, high-energy particles, and a coronal mass ejection (CME), which is an ejection of a huge bubble of gas, or plasma. In other words, it’s an event that sends a massive amount of charged particles into space. The Earth is protected by its atmosphere and magnetic field, so we are not directly affected by these charged particles. But in orbit, satellite instruments can get damaged and astronauts can be exposed to radiation. Also, a CME can cause a geomagnetic storm on the Earth - a severe fluctuation in the Earth’s magnetic field - which can damage power grids. We need space weather forecast to mitigate these effects. Q. Could you describe the impact of solar activity in more detail? For example, in October 2003, solar activity became very high and energetic particles from the Sun caused noise in a sensor on the JAXA Data Relay Test Satellite KODAMA. As a result, the satellite lost its orientation to the Earth, and ended up with a malfunction in its attitude control. Before its operators were able to start recovery work, they had to let a few days pass, waiting for the solar activity to calm down. Worse, a geomagnetic storm can affect satellites on low Earth orbit. The X-ray astronomy satellite ASUKA lost its attitude control during a major geomagnetic storm in 2000. It was unable to recover, and the following year it entered the Earth’s atmosphere and burned up. 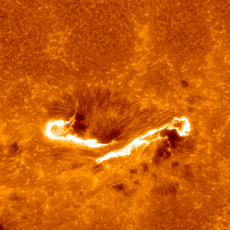 Solar activity can also damage power grids on the ground. 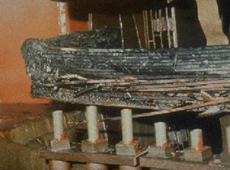 In 1989, induced current caused by a geomagnetic storm damaged devices at power plants in New Jersey, USA and Quebec, Canada. Power grids have built-in redundancy, so one damaged device does not cause an immediate power blackout. However, in Canada, a combination of multiple problems caused a major blackout, lasting about nine hours. Also, in 2003, Sweden experienced a large-scale blackout due to a geomagnetic storm. Apart from these incidents, X-ray emissions from the Sun can affect the ionosphere, which is 60 to 90 kilometers above the ground, disrupting high-frequency radio communications. Disturbances of ionosphere can also cause errors in GPS navigation systems. So the Sun’s activity can cause many different problems. But unlike the weather on the ground, space weather is invisible to the naked eye and not easy for us to understand. 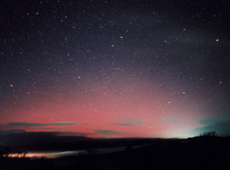 There is one phenomenon, though, that can make us aware of space weather: the aurora. Auroras are phenomena created by geomagnetic storms associated with solar activity, and in Japan, they can be observed in Hokkaido at the moment of a very intense geomagnetic storm. Q. When are space weather forecasts released? And what do they generally say? 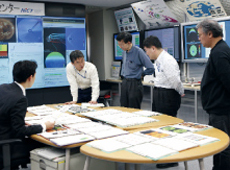 At the NICT Space Weather Forecast Center, a forecast meeting is held at 2:30 p.m. every day to make a prediction of solar flare activity, geomagnetic activity, and solar energetic particles (high-energy protons) within the next 24 hours. Then, at around 4 p.m., the information is released online. If there is something that can possibly affect the Earth, we put out a special bulletin. Furthermore, to promote the public’s understanding of space weather, we webcast a video, "Weekly Space Weather News" on the NICT Channel on YouTube. Our space weather forecast includes information about the solar flare activity, geomagnetic activity, and the status of solar energetic particles released from CMEs and reaching the Earth. We say things like: "flare activity is active, geomagnetic activity is quiet, status of solar energetic particles (protons) is quiet." We also provide information about the possibility of impact on high-frequency radio communications and satellite operations. 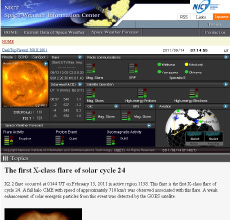 Related link: NICT Space Weather Information Center Q. Who are the main users of space weather forecasting? They are companies and institutions that operate communications and broadcasting satellites, and those who use high-frequency radio communications, such as people in fishery and amateur radio operators. GPS positioning systems have recently been introduced into air traffic management systems and surveying. They need to use space weather information because space weather affects accuracy of their positioning. I hear that satellite-positioning technology also has potential to be applied to unmanned agricultural machinery, such as tractors. So, in the near future, space weather forecast may be appreciated by people in agriculture as well as aviation. Q. How do the users use space weather information? X-ray emissions from solar flares calm down within one to two hours, but enhancement of solar energetic particles continues for up to a week, and geomagnetic storms continue for two or three days. I explained earlier that, for the Data Relay Test Satellite KODAMA, they had to wait a few days for the solar activity to calm down before starting recovery work. However, with commercial communications and broadcasting satellites, I think it would be difficult to interrupt service for that long. So it is important for the private sector to monitor space weather, so they can prepare for emergency situations and operate satellites with great caution. For example, if an instrument aboard a satellite goes wrong due to some sort of solar activity, you take a countermeasure, by using a backup instrument or shifting to a backup satellite. If you are prepared at all times for such a situation before solar energetic particles reach the vicinity of the Earth, for example, it will allow you to respond quickly and minimize any interruption in the services you offer.